Maia, Ed. Fondation Calouste Gulbenkian — French delegation, 2018. A chair drops and kills a dictator. Windows, doors and other daily life objects mysteriously disappear. These are the themes of two short stories published in 1978 by José Saramago in Quasi Objets, one of his lesser known works. In his book, José Saramago introduces ordinary objects that come to life and free themselves from their function. These quasi objects are endowed with consciousness and intentionality. They can act on the world, emancipate from an anthropocentric existence and even take revenge on a confident master. What happens to the OUMIS (objects, utensils, machines or installations) in Quasi Objets? Why did they leave? Where did they go? Saramago does not provide us with final answers to these questions. One thing is for sure: the story must be continued… Which is the aim of the first conference of this cycle. 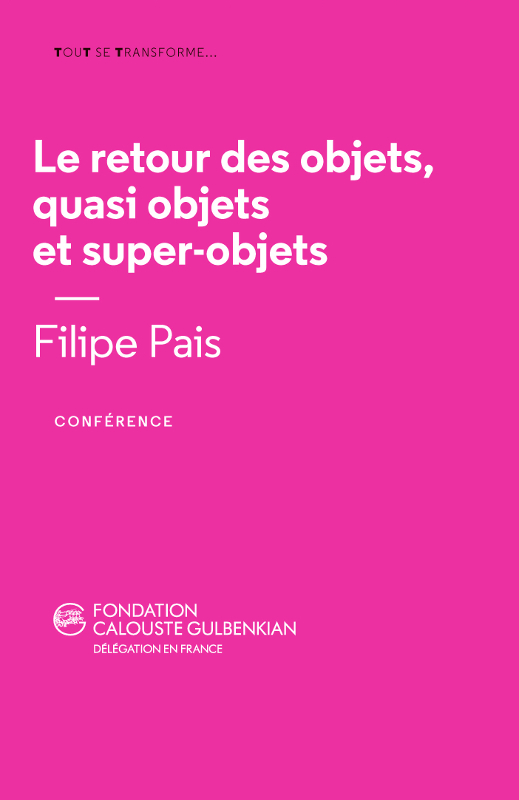 At the intersection of art, philosophy and design, this conference invites us to reflect on the notion of Quasi Objects and its influence on Michel Serres and Bruno Latour’s works and to imagine another type of object: the Super Object.